06 | July | 2010 | Will You Miss Me When I'm Gone? On Sept. 14, a recording of that monumental performance is being released by Nonesuch. What a long, strange trip it’s been. The magnificent, drone-based piece was mind-blowing in performance. Damrosch Park seemed ready to levitate from the amazing sonic pressure from the volunteer guitarists (plus 16 bassists and the sound of one hi-hat cymbal keeping the beat). I’ve heard the recording of the indoor Paris version of the piece, and while it’s amazing, it doesn’t quite do justice to the work. But I have high hopes that Nonesuch’s effort will top that. 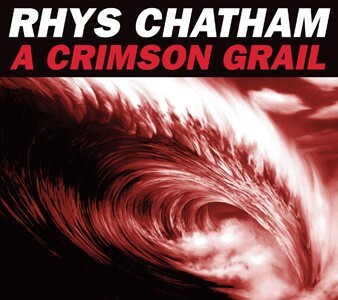 Nonesuch Records releases A Crimson Grail—Rhys Chatham’s work for large electric guitar orchestra—on September 14, 2010. Written in 2005 as a commission for the city of Paris, A Crimson Grail premiered at the basilica of Sacré-Coeur. It was created to work with the specific architecture of the basilica, making use of its natural 15-second reverberation time. The musicians surrounded the audience, creating an antiphonal effect with the sound moving around the space from area to area. Scored for as many as four hundred guitarists, an orchestra of approximately 125 musicians performed the premiere, to great acclaim. The Dallas Observer said of a recording of that concert, “Beautifully intricate and harmonically dense, A Crimson Grail is nearly ambient in tone while pursuing a beauty that never seems beyond its scope.” When Lincoln Center Out of Doors and Wordless Music invited Chatham to mount A Crimson Grail in New York at the Lincoln Center Out of Doors Festival, the composition had to be completely reworked for the acoustics of an exterior, non-reverberant setting. The Nonesuch recording captures the subsequent 2009 performance, in Lincoln Center’s Damrosch Park, with 200 electric guitars, 16 electric basses, 5 conductors, and percussion. 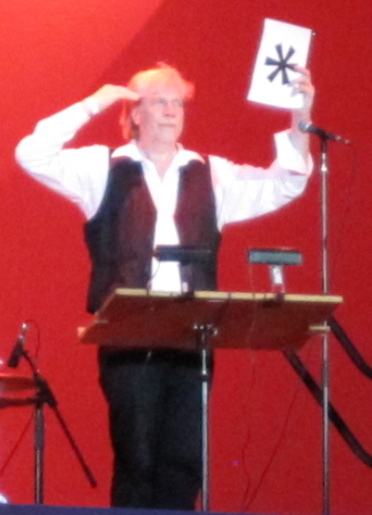 Rhys Chatham is a composer, guitarist, and trumpet player from Manhattan, currently living in Paris. He was the founder of the music program at The Kitchen in downtown Manhattan in 1971 and was its music director between 1971–73 and 1977–80. While at The Kitchen he was responsible for programming more than 250 concerts of living composers including the NEW MUSIC / NEW YORK Festival, which was the prototype upon which the NEW MUSIC AMERICA Festival was later based. Chatham studied under, was influenced by, or has collaborated with Maryanne Amacher, Don Cherry, Tony Conrad, Jon Hassell, Charlemagne Palestine, Eliane Radigue, Terry Riley, Frederic Rzewski, Morton Subotnick, Serge Tcherepnin, and La Monte Young, among many others. Click through to the jump for Givoney’s personal account of the journey from an idea in 2007 to a reality n 2009. 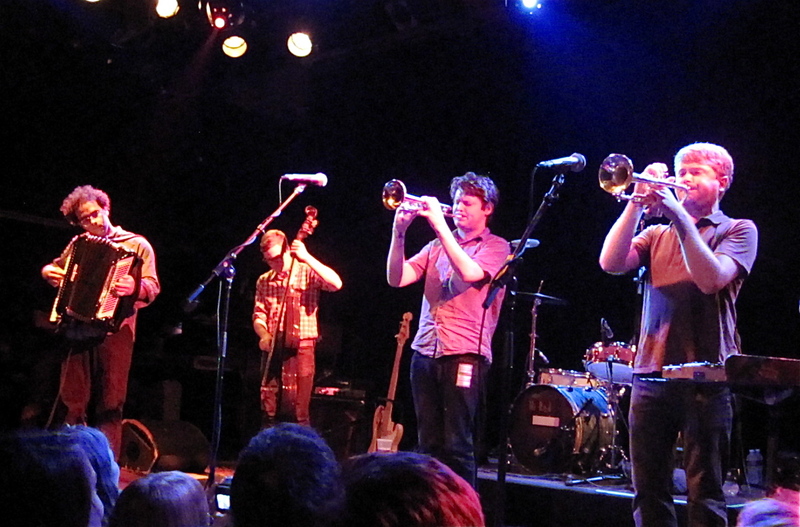 If you felt old at last night’s Beirut show at The Music Hall of Williamsburg, there was a reason. Elise, a fan in the crowd at my side pointed this out, saying that she felt like the oldest person in the room, even though she appeared barely older than the band’s 24-year-old frontman Zach Condon. Hey everyone, the first show on July 5th is an 18+ show, the second is 21+. We wanted to make sure all those of you without credit cards of your own or superspeed internet connections are able to potentially get tickets, hence why the $9.99 is only available at the box office and won’t carry any handling fees. Looking forward to seeing all you pale skins’ post-Independence day sunburns! Zach exudes a charm and confidence that belies his age. He appears comfortable onstage and has the swagger of a latter-day Sinatra. He’s not so much electrifying as he is charming and seductive. His warm style and the band’s tightness won a lot of love from the audience. If I had ever imagined that flugelhorn and trumpet would someday become this hip, I might have thought twice about giving up playing brass after high school. 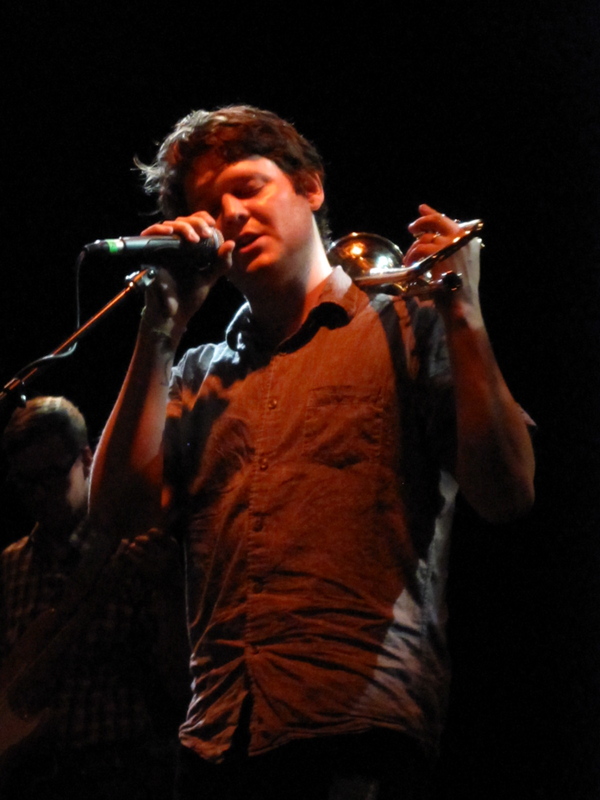 Zach and his bandmates are among a number of influential young musicians who have managed to make the rock world safe for old-school instruments — French horn, trumpet, flugelhorn, accordion, ukulele and trombone. WOOM is always in motion. The band's scrappy, bare-knuckled sound is irresistible. 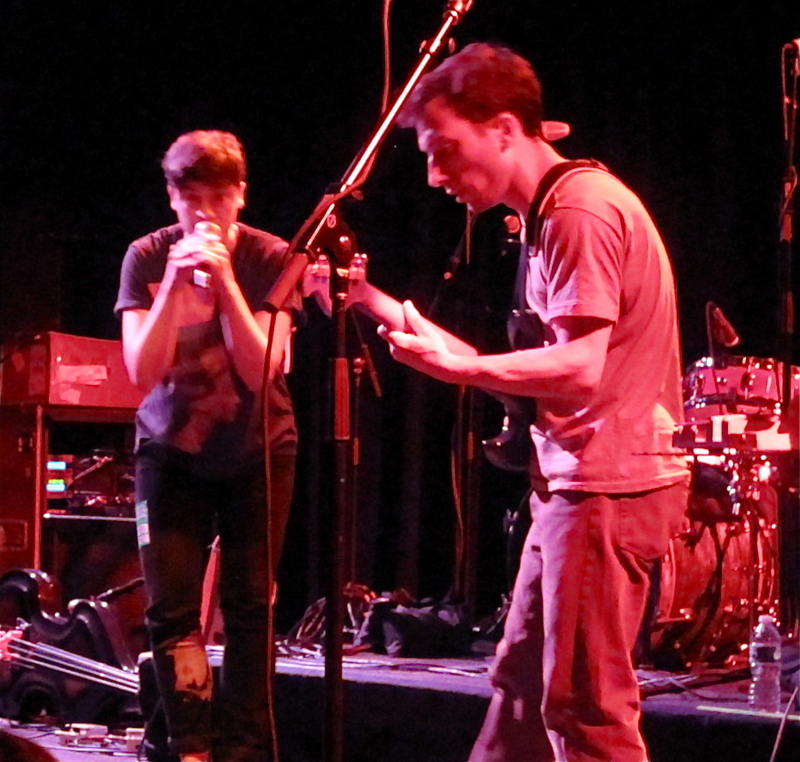 Openers WOOM, a silly but joyous husband-and-wife band, charmed the crowd with a nice set of DIY beats coupled with Sara Magenheimer‘s vocals and Eben Portnoy‘s scratchy guitar riffs. WOOM’s first full-length album, Muu’s Way, is out today on BaDaBing. It’s available from Amazon.com and other music outlets.